Earthquakes and volcanic eruption in Ethiopia | Watts Up With That? With two 5.7′s just before the eruption, and a sat image showing a rather tall plume in the equatorial region, wonder how high and strong this bad boy is. Nabro has no known modern eruptions. Dubbi has 2(1861, 1400). Man, did this one come out of nowhere. I’ve checked MODIS Terra and Aqua imagery and there’s no good imagery yet, if anyone spots any, leave a comment. Quakes are close to the surface. Between 2 and 15 km deep. caused by emissions, you say? It’s a fascinating area, a new plate boundary is being formed, and it’s mostly doing it above water. My guess is that the eruption is not very violent and won’t lift sulfates into the stratosphere. I wouldn’t lean to hard on my guess if I were you…. The East African Rift System (EARS) is one the geologic wonders of the world, a place where the earth’s tectonic forces are presently trying to create new plates by splitting apart old ones. In simple terms, a rift can be thought of as a fracture in the earth’s surface that widens over time, or more technically, as an elongate basin bounded by opposed steeply dipping normal faults. Geologists are still debating exactly how rifting comes about, but the process is so well displayed in East Africa (Ethiopia-Kenya-Uganda-Tanzania) that geologists have attached a name to the new plate-to-be; the Nubian Plate makes up most of Africa, while the smaller plate that is pulling away has been named the Somalian Plate (Figure 1). These two plates are moving away form each other and also away from the Arabian plate to the north. The point where these three plates meet in the Afar region of Ethiopia forms what is called a triple-junction. However, all the rifting in East Africa is not confined to the Horn of Africa; there is a lot of rifting activity further south as well, extending into Kenya and Tanzania and Great Lakes region of Africa. Since there has been a real concern in the past about the SAL (Saharan Air Layer), or the dust that blows into the Atlantic (it suppresses the formation of hurricanes during the Cape Verde season), is there a possibility that this will cause less hurricanes to form this season? I think, it’s probably the Dubbi Volcano, after comparing the satellite picture of the plume with Google Map. 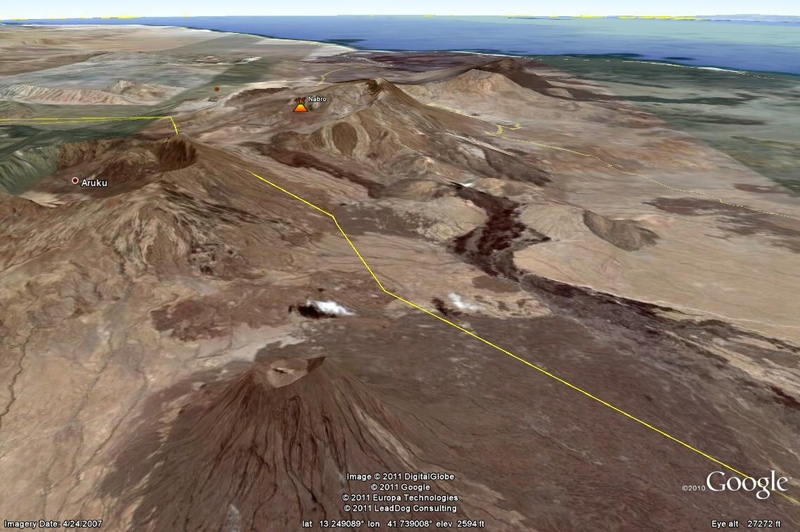 This volcano has a history of eruptions with both ash and lava flows. This area, the Afar Depression is in one of the most inhospitable and hotest places on Earth even without lava flows. Lets see if this plume also affects flights. Volcanoes occur at a higher rate in times of low solar activity. We should be expecting this. Has absolutely nothing to do with climate. Not far from the Afar depression (depending on how you define “far”). As many here no doubt know, the Afar depression is an area where the land is lower than sea level, caused by part of Africa splitting away. The only thing keeping the sea from filling this “new ocean being born” as it is often called is a chain of mountains along the coast. It has flooded before due to past sea level rise(s) leaving evaporated salts mined by locals. Why do I mention this? At some point, as the rifting continues, seismic cracks, erosion, and/or sea rise will again flood the depression maybe permanently this time. Most people expect this to take a long time but a recent earthquake a few years back showed that big cracks can appear very quickly in the region. I have heard that a small lake in the area is actually maintained by salty ground water intrusion from the sea but this isn’t fast enough to overcome the. evaporation from the scorching heat of the area and flood the depression. So I have often wondered if, one day, an earthquake could open more fissures that would result in the depression finally filling in a human noticable time scale. Is this plausible? The Great Rift Valley would make a great sci-fi thriller subject, without stepping on anybodys climate toes. Can you picture the rift opening at 75 mph, sending ripples that jack the ME 10’s of thousands of feet into the air? The formerly arid and baked Sahara becomes the African Alps. some people are so stupid this has nothing to do with global warming!!!! Deadman you are not that smart! What sort of material (hard rock or uncemented sediments) might the fissures be in? What is the elevation difference between the sea and the floor of the rift? Say it does happen – where can we safely watch from? Kizimen on the Kamchatka Peninsula is starting to roar again this weekend as well. Plumes hitting 20,000 with an expectation of plumes to hit 50,000. Then you have the Chilean volcano spreading ash all over the S. Hemisphere. Making for some beautiful sunsets. Meanwhile, volcanic ash from Chile is grounding flights in Australia and NZ. 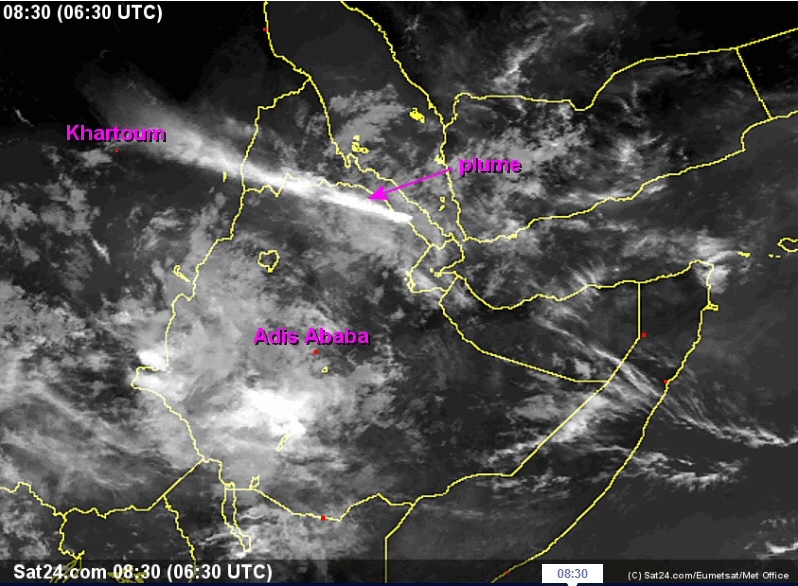 Just a layman’s question here, but how is the ash plume going to affect traffic in the Red Sea and the gulf of Aden? Is there any evidence of earthquake damage to the oil pipelines in the area? Looks like the plume is making its way over to Khartoum, Sudan with over 5+ million people there. Christchurch is not yet over their earthquake swarm either – two today – one a week ago. It is still before dawn there, probably won’t get any kind of meaningful reports until after daybreak. I think the point is satirical–global warming is often being cited in papers and magazines as a cause of earthquakes and volcanoes using dubious mechanisms such as the supposedly massive weight of the “rising” sea levels or the weight of storm surges caused by non compliance with the Kyoto protocols. Go to the Erruptions blog at Big Think for more information. Isn’t that area where Australopithecus afarensis, an extinct hominid lived between 3.9 and 2.9 million years ago? Most of our ancestors came from the Rift valley: we survived quite a lot more than “Global Warming”. BTW Anthony, thanks for the frontpage story here on WUWT. Not everyday a regular joe gets a story in. But I did figure this would be a potentially big story. The very fact that we are seeing some of these volcanoes have a quick swarm, and then just explode without much time is incredible. Goes to show you can’t trust that you’ll be given the time to leave when you are living near, or just visiting them. While the depression, I seem to recall, is basalt like that of the Atlantic rift forming the new plate material as the Atlantic expands, I am not sure what the mountains between the depression and the Red Sea are. If there was a major crack (or several linking ones) it would be something to see but I suspect it would happen more as an increase in water intrusion such as at that salt water lake. People would notice the lake level rising and at first it would only be on the local news. As it continued, some geologist would realize what was happening and the rest of the world would take notice. Over months or years, as the depression filled, the water would cool the area and reduce the rapid evaporation and water that flows in from the south west would stop drying out before getting to the lake, as now happens. These events would speed up the rate of fill. One might speculate that the growing weight of water might add to the tectonic forces in the region (since the depression floor is already thinner that most continental plates) which might trigger more quakes but that might be a long shot. If all of this happened in a few years it would have a major affect on the local climate. One of the hottest places on earth would cool and moisture would be pumped into the air. Unfortunately an important place for researching paleontology and geology would become inaccessible but biological and ecological effects would make for some interesting research. Some people have suggested using a tunnel to flood the depression on purpose to generate hydropower and create an inland salt lake but it has always been too controversial. Christchurch just got nailed with 6.0. Man, those poor folks. I’d be leaving that city. Oil extraction in the Saudi kingdom, Sudan, and Eritrea most certainly lessened the quake and volcanims with pressure reduction. Wow, I commented on the previous volcano posting and go mow the yard & weedeater and here’s another one! Yeah, the New Zealand situation is a bit nervous. As is Arkansas! Kamchatka has been fairly regularly honking tall plumes since 2008. Quiets down for a few weeks or so then shoots off a few plumes. Be interesting to see what the coming eclipse will reveal about any increase in SO2 in the stratosphere now. Being that Russia will have a good look. Going to need some serious cracking or tsunami to get water into that place. Millmeters of sea rise / decade isn’t going to get the job done in our lifetime. MSM hasn’t picked up the story yet. 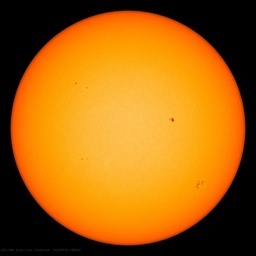 How interesting: Sun just went blank again. Just had another decent shake (mag. 6.0) here in Christchurch NZ. Most of the buildings that would have collapsed had already collapsed during the Feb 22 6.1 quake. I wonder why it is a US map that is referenced. I know who pays for that. It is afterall in a different continent in the Old World. Shouldn’t the Brits or perhaps the Chinese be funding this stuff ? I guess I am in a state of mind to look for ways to reduce government expenses. Warwick, NZ just received a 6.0 at 9.6km and 5.2 at 11km depth a few minutes ago. May have been near Christchurch again but not sure about that. Dunno about Australopithecus afarensis but Ethiopia is the ancestral home of coffee. Ethiopian genes from antiquity are extremely wide spread, ranging from northern Europe to Melanesia. Seems to me that the sesmic and volcanic activity occurs after a solar geomagnetic activity spike when sun calms down rapidly….. We had the solar flare event just a few days ago. NOTE – this is a non scientific and unchecked observation by me so it probably can be falsified by data. You can see the plume on the visible sat at the link provided for the sat images. Impressive! As has been mentioned, near-ish to the Afar region. Interesting place, and it the hottest place on earth. Salt is still mined there. Hope it settles or at least the plume stays where it is, my wife is in Addis Ababa right now. At least one person reporting a plume height of 50km! For comparison, Pinatubo was around 35km altitude. Yes, “Lucy”. And her remains are in a museum in Addis Ababa. Plume is almost at Khartoum, Sudan now. It is moving pretty fast, obviously in the stratosphere in order to move that quickly. We should remember that the Christchurch earthquake swarm started on September 3rd – by mid Sept. Govt expert scientists were calling it “textbook” and “fading”. How wrong was that. Prior to Sept 3rd the Christchurch area had not been noted for earthquakes. You might feel shakes from further afield like the Alpine Fault region – but Christchurch was pretty quiet. So post- Sept 3rd is a whole new ballgame – rolling on and on. Crosspatch, I think that was 50k as in feet. Is there some metric for total volcanic activity or intensity? Is it graphed over time somewhere? Seems like we might be on some sort of spike on that metric. Not a bad idea at all. Big Flare, big lull. Rock has a property where if you put pressure against it, then release that pressure, the material that moved falls off. I think Deadman must be a Politician or a Watermelon(green on the outside red in the middle) either way he’s not real bright. You might what to check his blog before you make that assertion. Click his name in his comments, or click http://impactofcc.blogspot.com/ Consider a little research before commenting, please. Somewhat OT. Further to what you say the only guy who has had a modicum of success at predicting future earthquakes in NZ since Sept 3rd 7.1 quake is a Kiwi fella called Ken Ring. His theories about short term weather and quake predictions are based on lunar activities. He was hounded by the MSM and so called Govt expert Geo scientists as a publicity seeking charlatan and scaremonger. The negative publicity made him go into hiding. Shame on the sanctimonious pisspot scientific orthodoxy and MSM for not at least allowing him a proper hearing. For those who knock Deadman suggest you visit his site before firing your next slavo. It was 50km but it is now been clarified as the width of the plume at the time, not the altitude. There is an initial ash advisory that puts it at about 30,000 feed (FL300) or about 10km altitude. Note, this eruption “came out of nowhere” and is in a very sparsely populated area. There probably won’t be any webcams pointed at this one. Christchurch NZ have had 15 aftershocks so far today (13 June) – highest 6.0 on the scale. They have had 7285 since the Sep 4 quake, 2857 since Feb 22 and 57 in last 7 days. You can see them all at http://www.christchurchquakemap.co.nz . Sources for the link between low solar activity and volcanoes? Or are you just blowing ash? Well. Mother Gaia has provided 3 major volcanic eruptions for the warmists to point to if her temperature fails to rise as they modeled/planned/hoped for in 2011. RE: Sources for the link between low solar activity and volcanoes? Or are you just blowing ash? I have actually been to Aksum, Ethiopia, which by my reckoning is about ~200km away to the west. I’d imagine the town will be receiving a light dusting. Cheers, Jeff and Fred Nerk. could do with some work. Well I be a damn Razorback. You have to go all the way back to the 1930’s to find as many eruptions as we’ve been having since 2008. If you read up on what climate conditions were like right before the droughts, it sounds like NOW! Actually reading up on the cold waves and heat waves during the 1930’s shows a perturbed pattern resembling what we have now, in my opinion. Interesting read, and I did exactly as you…hummmm. Yes Ed. The 1930s were undeniable proof that even much lower CO2 levels can cause the dreaded Climate Disruption. Another hmmmm here. Very interesting. So while the ultra-convenient claims that the Planetary Fever could cause increased volcano activity are clearly ridiculous, increased volcano activity, driven by solar variations, actually could cause climate changes. How marvellously inconvenient! And don’t forget that semi-ominous plume of SO2 that showed up over Iceland several days after Grimsvotn shut down. No additional plume, no monster quakes, just foom. Likely all of this was tropospheric… I think. Erta Ale, the tourist attraction and featured on many programs, is a shield volcano. Mostly basalt, runny, not very scary. It in the center of the rifting area. Nabro and Dubbi are both stratovolcanoes and have a higher silica content. The makes their lava more sticky and prone to explosive events. Neither Nabro/Dubbi (dunno which yet) or Puyehue-Cordón Caulle were expected. I think Puyehue made its presence known about 24 hours before it went pop. It still up in the air, but some of their volcanologist are indicating that the crater formed in the river Nilahue. More than likely in the rivers headwaters. Not as bad, but still not good. Water and magma don’t get along so well. Grimsvotn on the other hand, erupts about every four to seven years. It was just a matter of time before it or it’s brother Bardabunga erupted. (just as large and just as consistent). Things to watch… Taal, Popocatépetl and the Dieng Volcanic Complex. Oh yeah, Kizimen erupted again.
. Further to what you say the only guy who has had a modicum of success at predicting future earthquakes in NZ since Sept 3rd 7.1 quake is a Kiwi fella called Ken Ring. Ken Ring is a class A crackpot. He is only “accurate” in that way that anyone who makes enough predictions is accurate: by sheer luck. He is also a public nuisance because he detracts attention away from real experts. For every Galileo battling against the status quo there are a thousand loonies. Ring’s dismissal by the media is a good sign. It is a win for science. Yes, VEI, the Volcanic Explosivity Index. Degree of certainty is uncertain. First, we have a southern hemisphere volcano in Chile cook off, and that ash column went so high that it’s causing flight delays in Australia! That ash plume had to mostly reach the stratosphere to make it to OZ that fast, and it had to come the long way; across the Atlantic and Indian Oceans. (the prevailing winds, especially at high altitude, mean it could not have come the other way). 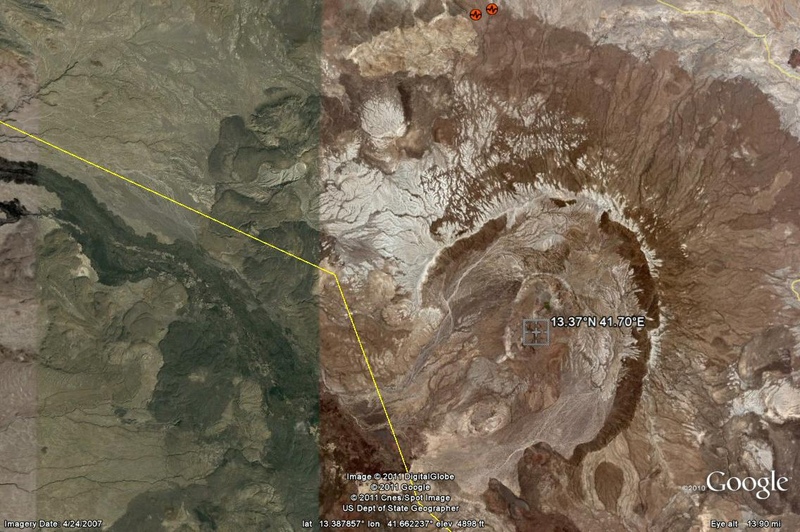 Now, we have what looks like a huge eruption at Nabro, in Eritrea, which is in the northern hemisphere. From the look of it’ calderas, and what little I’ve found, it looks like a big one, capable of infrequent but massive eruptions. If we do have two massive eruptions, one in each hemisphere,(and it looks like both have at least the column height needed) is there a risk that this might cause a Pinatubo-scale cooling event? Earthquakes are associated with the eruption and magma moving in the vent. This magma is fairly viscous, due to high silica content, so causes more movement. Husband’s cousins all live in NZ, one in Christchurch. When the first earthquake hit last year his house was condemned and he and his wife moved in with one of their children and grandchildren, crammed into a small flat. Cousin and wife then found a flat to rent and moved out, pending the rebuilding of their house. The quake yesterday caused a fire in the son’s flat, so he and his wife and children have now moved into the flat with his parents. A right old merry-go-round. How they manage to stay cheerful, I do not know, but they do and are to be admired for their resilience and love of their family. Not much news on the normal news channels. At least not in Europe. You are very correct. The Afar region is ALREADY below sea level. The whole region is “pulling” itesel apart. This eruption won’t affect my wife, as it is, but the Chilean eruption apperas to be causing massive disruption to Aus. Volcanoes! Great Earthquakes! Global This-n-That! Economic Downturns! Recessions! Depressions! Chinese Revolutions! Arab Insanity! Great Storms! Why does everyone go “Chicken Little” when these things happen? Must be something in the water! Would someone wake me when things calm down? I’ve got three full time jobs and haven’t slept for over a week. The main issue is they have not experienced such significant events in RECENT HUMAN history. That is the problem. If anyone who studies geology and looks at Christchurch (ChCh), Wellington and even Auckland, can see, CLEARLY, there is risk of activity. Look at the geology of ChCh…its a volcano reminant, active? Who knows. Modis has an Ethiopia subset, where you can get once-a-day high quality images. Dang it, what I used to call just a typical “lucky streak” is getting long enough so I need a third hand to help wave. OTOH, maybe it’s about time to rewrite 2016: The [Next] Year without a Summer, my companion (and completely different) page to 1816: The Year without a Summer. Good grief – that 2016 page is seven years old. So, if there’s an inverse correlation between solar activity and volcanic activity, is it predictive in some useful way? E.g. what’s the next Cascades volcano to erupt? Is there going to be a match the Mt Tambora in 1815 which may have been the biggest in the last 10,000 years or so? Belated congratulations Anthony. You were the first blog to report, I think. I checked Dr. Harrington’s Volcanism Blog yesterday right after I read your post and again last evening, and he hadn’t anything up. “The Great Rift Valley would make a great sci-fi thriller subject, without stepping on anybodys climate toes. Can you picture the rift opening at 75 mph, sending ripples that jack the ME 10′s of thousands of feet into the air? The formerly arid and baked Sahara becomes the African Alps”. Sounds like an extinction event to me. periodicity as the volcanic activity. activities during the last five centuries. The correlation isn’t very significant, only 2 sigma. Though, I can think of several plausible mechanisms; magnetice field changes, cosmic ray changes,a combination. We know certain CR ionize certain molecules in the atmosphere. I’d be suprized if there are not similar effects in other fluids which would affect pressures, circulation, and the compostion of emissions themselves. Good view from MODIS right now. Flights have already been cancelled tonight out of Addis Ababa heading North. Can this depression fill on a human time scale? Did Noah build an ark? May almighty God protect my innocent Ethiopians living in the area. This is man made volcano and earthquake. Now they will demand to get in to the country to help. The same seems to be happening in Chile….and everywhere where these earth “scars” are located. earthquake. It is easier to beleive that the chineezzzze gov caused it by planting something there rather than the gravitiy of the flares or some sort of shock or magnetic field. there has not been any earthquake there for ages. My WAG on this is that it has something to do with relaxing of magnetic field lines. The damage, in that case, has already been done, and magma in various places is now facing weaker strata to push through. I am very miffed at the dead quiet of the MSM on this. Not Fox, ABC, NBC or CBS. Usually, they are all over any volcano. That’s not unusual in volcanic regions, just check out Rotorua in New Zealand. Has there been an increase in activity in Yellowstone park? So far in this post is an absence of the word “carbonatite”. East African rift vulcanism produces one of the few instances of carbonatite lava on the planet. Carbonatites are basically calcium carbonate (CO2 + CaO) magma…erupting black and congealing white…and emitting a mess of CO2 in the process? Nabro itself is a trachitic volcano, starved of the silica found in andesitic or rhyolitic volcanos; more typical of ocean crust, which essentially floors the Danakil depression or “Afar Triangle”. These alkalic to sub-alkalic eruptions may afford a dry-land analogue to the mid-ocean ridges of the world…and the results may be surprising.